It is so hard to believe that my oldest son is going to start Kindergarten next week. My younger two are also starting pre-school at the home school co-op too. Amid the excitement we had the perfect opportunity to review the new Wow! Wow! Wubbzy! DVD called Wubbzy Goes to School. 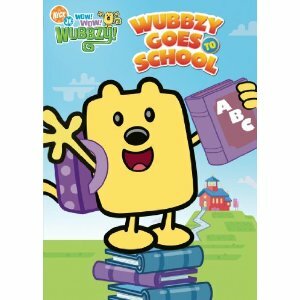 In this adorable DVD, Wubbzy and his friends go on six adventures as each episode explores starting a new school year. I really appreciate the use of humor in each episode as a way to teach our young children valuable lessons. My three children, ages 5, 3 and 2 are big fans of WOW! WOW! Wubbzy! and really enjoyed this DVD. My son requested to watch it again the next day and seemed to be reassured when Wubbzy made new friends at school in one episode. It made me realize that he has been feeling a little bit anxious about his new co-op classes. I was able to reassure him and talk about â€œfeeling scaredâ€ about starting a new adventure. This would make an excellent gift for any young child who is getting ready to head to school for the first time or is starting at a new school. You can purchase your copy at major retailers near you for $16.98. I follow Wubbzy on Twitter (mail4rosey).